This pack contains a collection of enhancements to original SEGA arcade games from the 1980s. It is intended to be used to reprogram the original hardware. Please note that no portions of the original game code are included in this package. This software is free to use, but not to be sold or used in a commercial product or activity (i.e. do not sell programmed EPROMs on eBay!) For full details please read the license included in the package. Patch Space Harrier to run on Enduro Racer Hardware. Compatibility, programming and installation instructions can be found in the documentation. I'd like to thank Darren Finck and Adrian Smethurst for contributing to this project and for providing hardware testing. Older OutRun specific online documentation here. Thanks for sharing these blog updates - good to hear from you again. The original pcb reports ram location IC55 bad when in fact IC54 can be totally out of circuit.. is this issue addressed? If you can send me the correct mapping, I will get a new version up. All i know right now is that IC55 will report bad, when in fact its a faulty or missing IC54 for definite.. Rev A romset and Rev A pcb. You will need the following original "Out Run (sitdown/upright, Rev B)"
Place these files in the 'rominjector\in' subdirectory. Name them as above. Cool. I'll correct that next time round. It shouldn't affect anything with regard to the patch. Have you thought about create a mod for Turbo Outrun to use the music from Outrun? would it be possible? Possible but not easy... not something I'm planning. Any chance that you can make a patch for the original version (aka the Japanese version for us here in Japan)? Revision A and B are known as the World versions here. I'm not planning to extend this to support the Japanese version at the moment. Hi! This patcher doesn't seem to apply to the percussion ROM (opr-10188.71), even though there is a patch file for it.. The .java source doesn't seem to make any mention of said file, which makes the executable completely ignore it. Unfortunately, I don't have a Java compiler to try and remedy the situation myself. Please note that the only way to patch the audio ROM is with bspatch. Great piece of work here man, really appreciate it. it says this for all 4 patched files, I couldn't tell if they are working or not though as the game runs. jthjfgj - What are you trying to do with the roms and where are you getting the error message from? 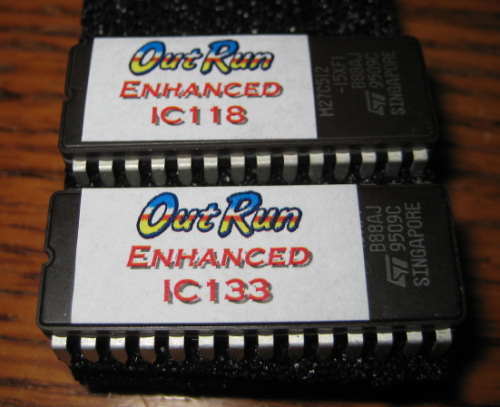 Cannonball uses the original roms, with the exception of the audio rom which can be used. There doesn't seem to be any instructions in the read L me on how to use this package with the Japanese version of Outrun. I tried it with the DX ROM set but this is still the overseas map layout. Appreciate any advice! 胡裕如 - For OutRun DX, use the bspatch files for now... it looks like I didn't update the rominjector files correctly. i cant patch the file, the tutorial is very incompplete for newbies like me... how do i run the java code? or can someone patch me the files for Super hang on and send them to my email please? Hi will you update The pack whit the freeplay fix for afterburner soon? Please. I'm working on a full release for AfterBurner: New Music, High Score Saves, Freeplay Mode & More. Expect it in the coming months. Hi i have the protected version of super hang on, can i use this fix on it? Super Hang On Protected - you would need to convert the boardset to a vanilla 68k, get that working first and then program the new eproms accordingly. Documentation states in outrun.txt bullet in chapter 5: " 4/ Out Run (deluxe sitdown) - Not Compatible". Please update! You've misinterpreted the documentation. It references 'ROM versions', not machine types. You're patching a ROM, so need to know which source versions you can patch. Deluxe Sitdown is the MAME naming of a particular ROM set (aka the Japanese original release). Yes, it's a bit confusing but I am keeping consistency with MAME to avoid confusion. Can the patched Revsion B roms be run on Revision A hardware? I've patched and burned the b roms to eproms, and verified the checksum burned to the patched versions and they are the same. yet when I put them into a revision A board (what my outrun mini has) the screen comes up garbled. Hey Steven, did you have any luck? I believe I'm in the same boat. I just picked up an Outrun that at first glance appears to be Revision A. I'm a bit confused as to if I will need to burn everything over to Revision B, test my game, and then try to apply Enhanced to it, or if I can just modify those 4 roms. Sounds like in your case it didn't work? Nevermind, just got around to it and it seems to work fine. Thanks for the awesome mod! Loving the better working attract mode and the preview of the songs on the song select! For Modern Machines: An Open Source OutRun Engine. OutRun, Super Hang-On and Space Harrier improvements. Intended for the original arcade hardware.